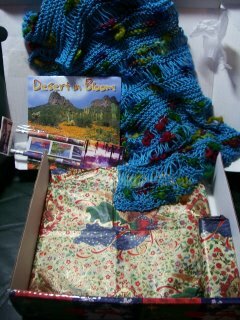 Gail's Good Yarn: Presents in the mail!!! A thousand thanks to Jen from Barcelona, Spain and Arizona, USA for the surprise package that appeared at my front door today. I usually don't get packages, so this was a big surprise. 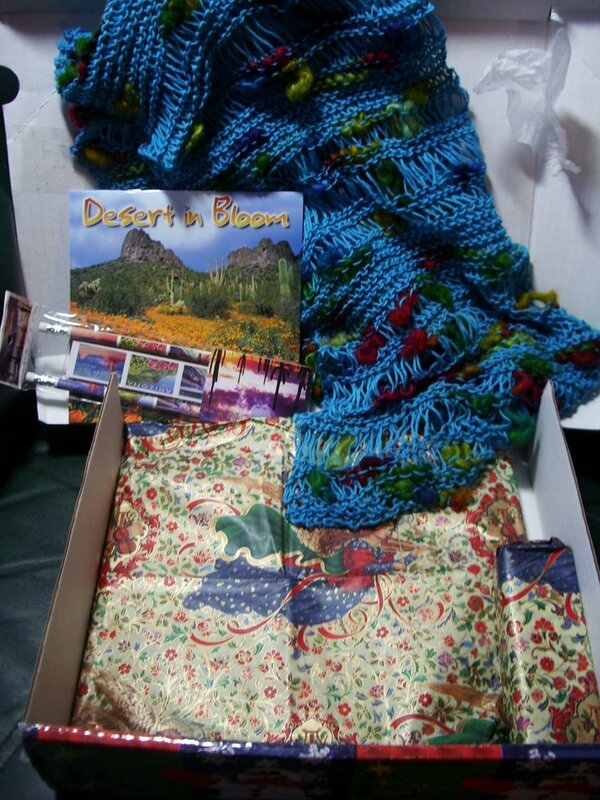 She sent me my favorite yarn! 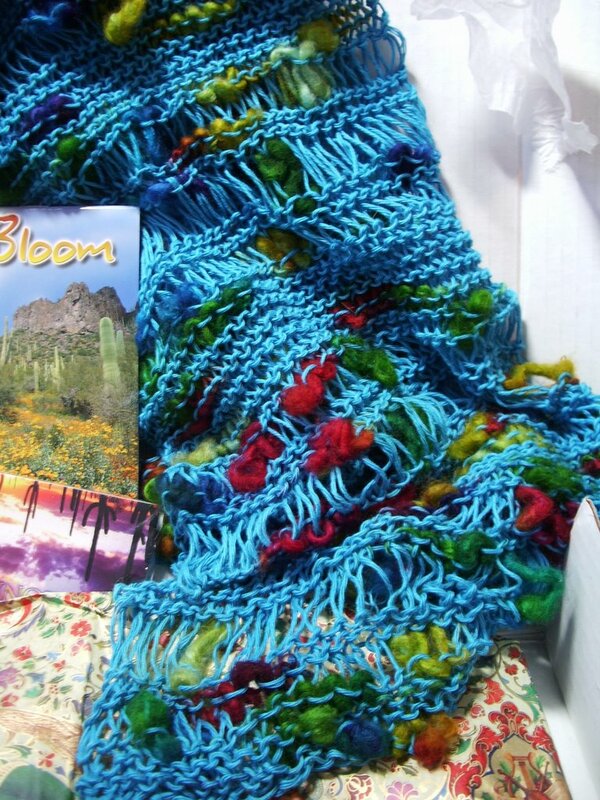 This is well travelled yarn. 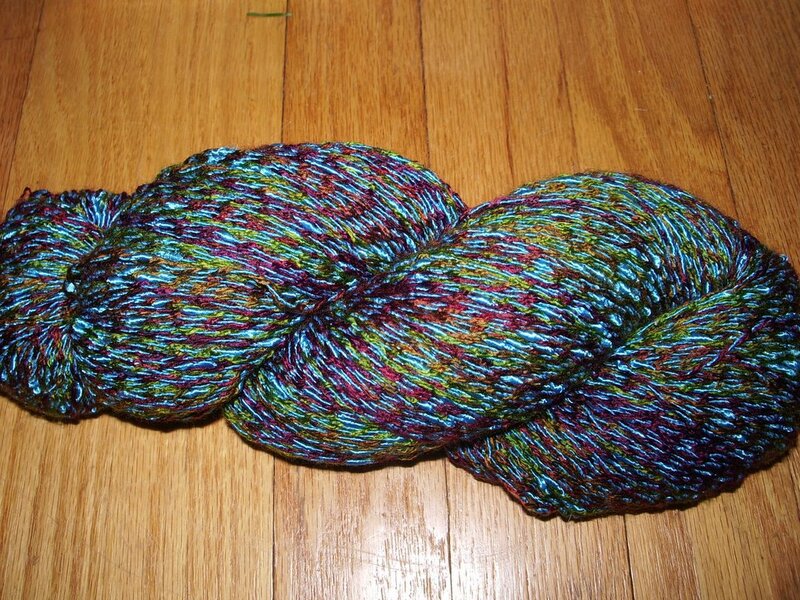 It was made in Argentina, then shipped to Barcelona where Jen purchased it from Barcelana--my favorite yarn store in the entire world!! Then, she brought it to Arizona, and shipped it to Wisconsin!!! I have to think of something stylish and elegant to make with it. Something in keeping with its jetsetting life! In addition, she knit me a marvelous scarf, made with turquoise blue cotton yarn that has big blobs of colored roving in it. It is spectacular!! Also, a colorful calendar of Arizona--a place I have never visited but am now dying to see. And a ruler and pencils from Arizona as well. I absolutely love school supplies and I will use my Arizona pencils for my Spanish homework next semester. In addition there are two christmas wrapped presents. I was about to rip off the wrapping--as is my style--but my 14 year old stopped me. Saying in a firm but tolerant voice, "mom, that's for CHRISTMAS. You have to wait." Now, where did she learn that phrase, I wonder. Jen, you made my day and boosted my sagging spirits. This morning I had a 7:45 Spanish exam (two hours), returned home and worked feverishly on a paper due today, then went to a doctor's appointment about my hearing loss, then came home to face my paper again--and instead I received a wonderful surprise. A thousand thanks. And, I can't wait for Christmas morning!! 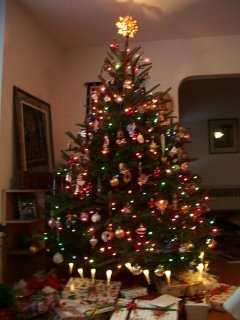 Speaking of which, here is a blurry photo of our Christmas tree. Photos with small, instamatic type cameras do not do justice to Christmas trees. It is easily the most beautiful, best decorated tree on the planet. however, you couldn't tell from this photo!! Yay! I'm glad it got there safe and sound. I hope you like everything!